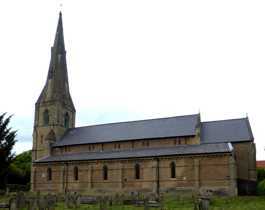 Holy Trinity church was erected in 1844 by Weightman and Hadfield of Sheffield. It cost £2500 to build and the money was raised by public subscription. £2000 of the cost was donated by Mrs Catherine Heathcote who ran Elmfield House School located on the Burgage in Southwell. The church was built to provide an Anglican alternative to the more choral services of Southwell Minster and also to provide some much needed extra accommodation for parishioners. The church offered a ‘simple form of congregational service in which all might be able to join, and which all could appreciate and understand’. Of the many vicars since Holy Trinity was built, two are particularly memorable. The Revd John Connington (1846-1878) was an eloquent preacher, but had strict ideas about the upbringing of children. He would lecture any mother who he thought was failing in her duty, even stopping her in the street to do so and if he considered that any child was being spoiled through the sparing of the rod, he would seize the miscreant and punish him with a whipping!